A rose in the very pink of condition taken in our garden last summer. Rose thorns are actually prickles - outgrowths of the epidermis. While the sharp objects along a rose stem are commonly called "thorns", they are technically prickles — outgrowths of the epidermis (the outer layer of tissue of the stem). (True thorns, as produced by e.g. Citrus or Pyracantha, are modified stems, which always originate at a node and which have nodes and internodes along the length of the thorn itself.) Rose prickles are typically sickle-shaped hooks, which aid the rose in hanging onto other vegetation when growing over it. Some species such as Rosa rugosa and Rosa pimpinellifolia have densely packed straight prickles, probably an adaptation to reduce browsing by animals, but also possibly an adaptation to trap wind-blown sand and so reduce erosion and protect their roots (both of these species grow naturally on coastal sand dunes). Despite the presence of prickles, roses are frequently browsed by deer. 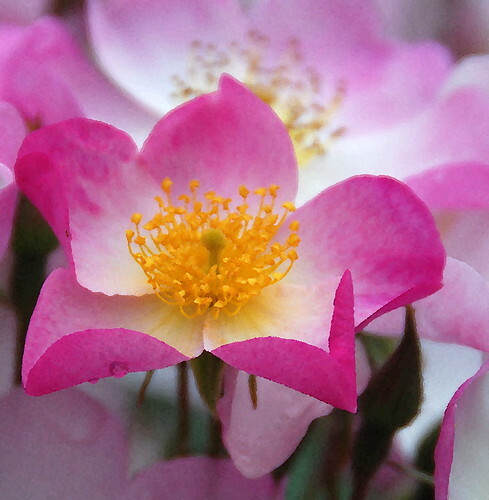 A few species of roses have only vestigial prickles that have no points.